Carlsbad, Calif. February 4, 2015—Arc-Zone.com is looking for women welders to profile for the “New Rosies” column on the company’s blog at CarmenElectrode.com. Since its inception in 2007 the column has showcased a variety of women working in many facets of the welding industry. From pipe welders to automotive fabricators, from steam fitters to television show hosts, the “New Rosies” perform all kinds of work in the industry. 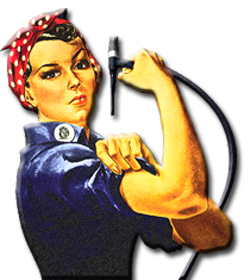 The blog, the first in the welding industry, premiered in 2004 and by 2006 was focusing on issues related to women such as tips for success in a male-dominated industry, and fun facts about Rosie the Riveter—including profiles and photos of the original Rosies. The New Rosies column has featured over 35 women whose interviews continue to be the most popular pages on the blog. Arc-Zone.com is committed to celebrating the amazing men and women who work in the welding industry through the company blogs and through its social media channels. Founded by master fabricator Jim Watson in June 1998, the company delivers proprietary, brand name and OEM replacement parts and accessories for GMAW, GTAW and Plasma Arc Welding and Cutting applications to customers worldwide. For more information, visit the web site at www.arc- zone.com, call (800) 944-2243 or email sales@arc-zone.com. This entry was posted in Arc-Zone.com, Carmen Electrode™ on March 2, 2015 by Editor.